This is an image of the view from our backyard, and a shot of a painting I did of Claudia, that goes with today's theme. Claudia is a magnificent model because she changes her entire look every couple of months. I was reading Bob Burridge's thoughts on painting (check out yesterday's copy for his web address). I love how he gives you permission to have fun and enjoy painting -- not to aim for results, or think about who wants your work, or pleasing others when you paint. and a clear predictor of my future. paint the opulent fabrics which my mother had, and still has a great fondness for. 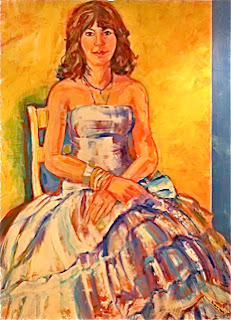 I have a particular penchant for white dresses, although white is a no-no in the painting world. The kindergarten painting also said something about my mother -- a woman who could easily have managed the act of balancing a swaddled infant, elegant clothing and eating cake with aplomb. She was and is the inveterate multi-tasker, talking on the phone while reading a magazine, looking at the birds, and popping home made loaves of bread and trays of cookies in and out of the oven as the timer bings. but at the same time I have to do what I do. live in bad taste, take a risk. We'd rather live and die neutral. As a foreign policy strategy I think that's a brilliant concept. But couldn't we take on some of the internal and external vibrant colour in our decor, used so tastefully and joyfully in England, Sweden, France and Italy? I think we could. I think Toronto is going through a maritime shift. The first time I visited P.E.I. a trucker driving a flatbed of massive logs said, "if you don't like the weather -- wait five minutes. It's bound to change." Five minutes ago I took the picture of my backyard swathed in mid-afternoon gloom, and now the sun is out again.